These 25 Easy Christmas Treats will add just the right amount of sweetness and cheerfulness to your Holidays and save your time during the busy holiday season. From sugar cookies to chocolate peppermint barks, all these Christmas treats recipes are super easy to make and without excess calories. Yup, it’s that time of year! Sweet tooth is in FULL force! With Christmas just around the corner, now’s the time to make some delicious Christmas treats. And of course, enjoy delicious sweets. All my senses screaming gimme all the cookies, all the sweet treats. It’s time to indulge and time to be cheerful. But still, there is a HEALTHIER way to enjoy Holiday season. Today I’m sharing my favorite easy Christmas treats recipes that are REFINED SUGAR-FREE, delicious and completely guilt-free. Hazelnut Chocolate Balls are delightful little treats. These soft and sweet bliss balls are delicious hazelnut goodness that are loaded with only natural HEALTHY stuff and nutrients, completely REFINED SUGAR-FREE and waistline friendly. These Gingerbread Energy Balls are just delicious. Nutritious, sweet, flavorful and beyond amazing. They are loaded with NATURAL proteins from nuts and seeds, and with amazing SUPER SPICES. Crunchy, nutty with touch of caramel flavor, these HEALTHY refined sugar-free Almond Sugar Cookies are the perfect Holiday sweet treat. These whole grain cookies are full of nutrients and super low-calorie. Packed with amazing flavors, these Turmeric Cacao Energy Balls are simple yet so delicious treat that is both satisfying and good for your health. Nutty and sweet, these little power balls are ideal for Holiday snacking. Soft, sweet and just delicious, these Carrot Cake Energy Balls are perfect bite size dessert. These yummy bites are flavored with fresh ginger, refined sugar-free and sooo addictive! Bursting with beautiful citrus flavor, these Lemon Turmeric Balls are perfect Holiday treat. Packed with powerful super-spice TURMERIC and chia seeds, these beauties are not only super HEALTHY but delicious too. Decadent, soft and fragrant, these Chocolate Cinnamon Balls are perfect guilt-free Holiday treat. These little delights are loaded with bittersweet dark chocolate flavor, so delicious and yet so HEALTHY – made without added sugars. This easy keto fudge recipe needs just 4 HEALTHY ingredients and 10 minutes prep. Isn’t that perfect or what?! Crispy, loaded with chocolate flavor and super easy to make, these Rice Crispy treats are ideal for Holiday guilt-free snacking. They look super cute too. Nutty, sweet and loaded with flavor, these beauties have only 6 ingredients AND they are super easy to make. 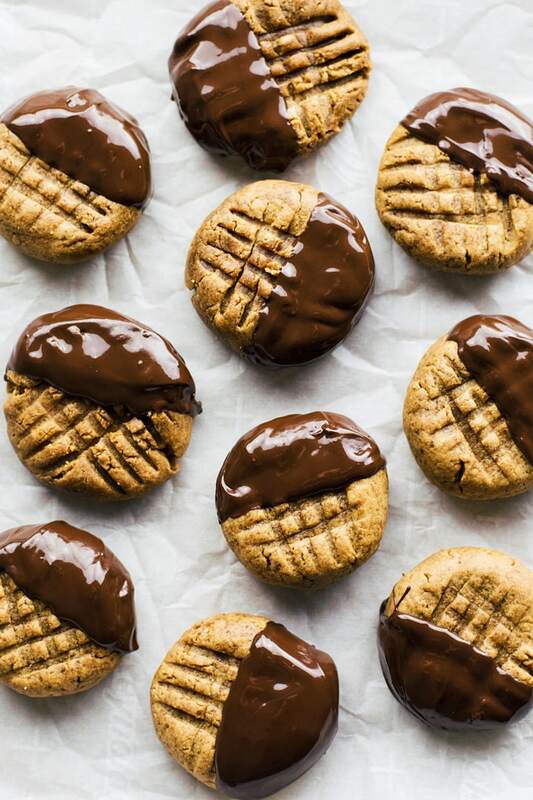 If you are a peanut butter lover, you will love these soft and chewy flourless cookies dipped in dark chocolate. They are loaded with peanut buttery flavor, contain no flour, and are naturally sweetened! SO easy to make and absolutely addicting. Loaded with peanut butter and chocolate this fudge makes a perfect Christmas gift for teachers, neighbors and friends. Easy and decadent, these grain and dairy-free Dark Chocolate Peppermint Truffles are the perfect holiday treat! These almond meal cookies are light and delicious! Easy to make and healthy to munch on. Perfect for the next Holiday party. 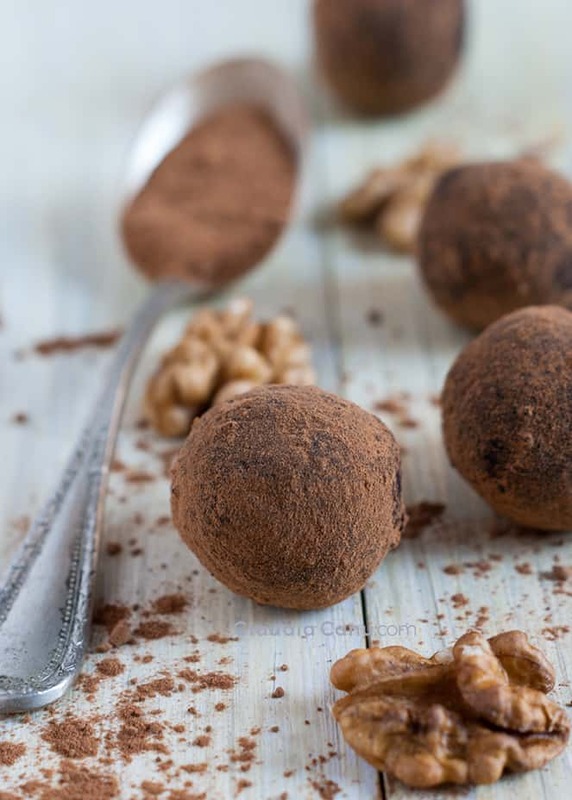 Simple, real food ingredients come together to make these bite-size balls of gluten and dairy-free dark chocolate lover’s heaven! These Chocolate Peanut Butter Truffles are as easy to make as sticking everything in a blender and rolling the mixture into a ball! They are wonderful plan-ahead treats to store in the fridge or freezer. These Matcha Truffles are the perfect holiday dessert recipe! They are healthy with NO refined sugar but no one would ever guess they’re made with good-for-you ingredients! 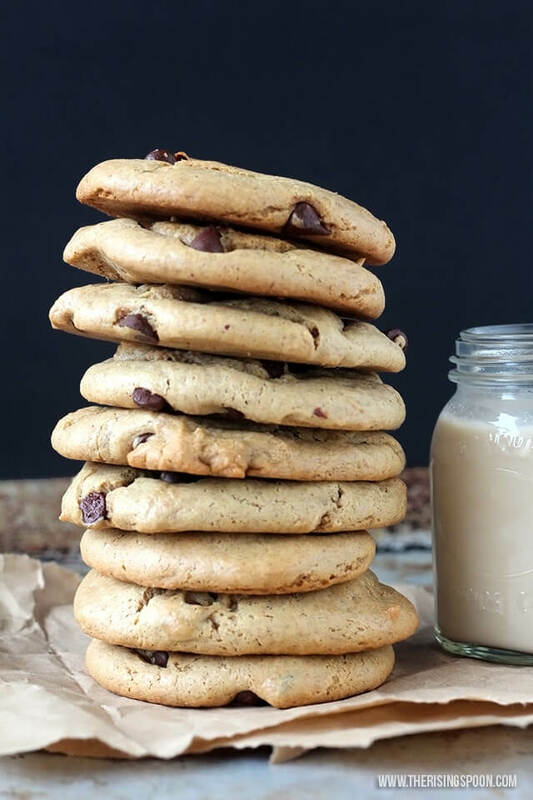 These cookies are incredibly soft, full of rich peanut butter flavor, and they develop a wonderful chewiness the day after baking them. Yum! 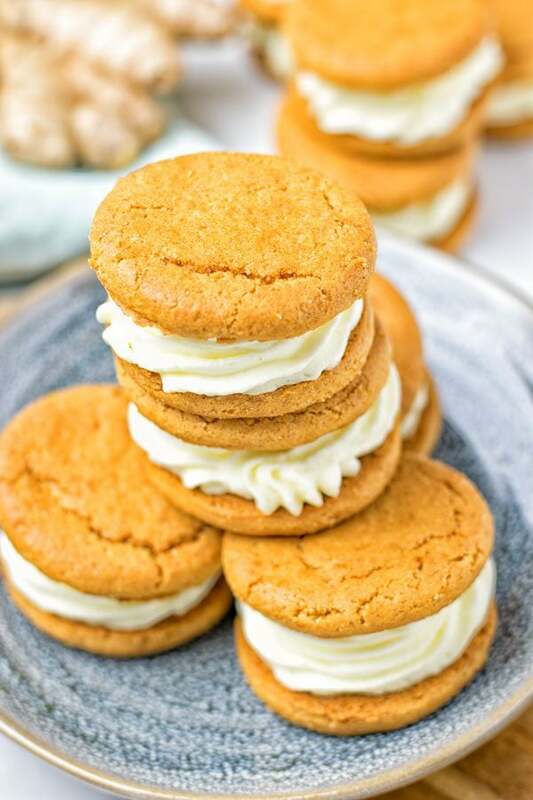 Rich and indulgent Whoopie Pie Ginger Cookies are full of holiday season flavors. Ginger flavored dough is combined with a coconut cream filling in a delicious cookie. So delicious! This Peppermint Bark is easy to make and only requires 3 ingredients. Dark Chocolate melted and flavored with peppermint extract for minty taste. Then topped with crushed candy canes. Perfect to serve around the Holidays or even great as a homemade gift. Perfectly chewy, sweet, and packed with warm cinnamon these cookies are yummy. Only 6 ingredients and 15 minutes needed to make these quick and easy cookies! What are you waiting for? 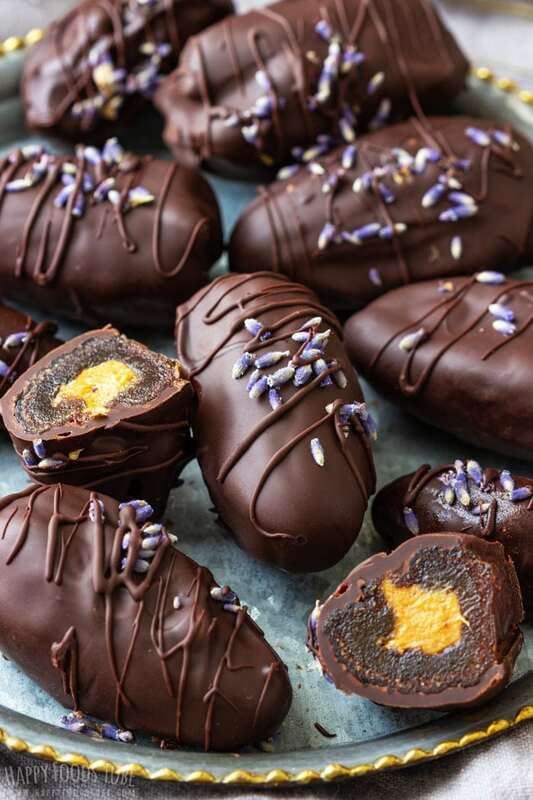 Peanut Butter Stuffed Chocolate Covered Dates make the perfect gift for your friends or loved ones. This delicious and healthy snack will look so pretty on your Holiday table. Such a great list! I need to try out that keto fudge! I want to make every one of these cookies! So many cookies, so little time. I think I’m going to go with the almond crescents first. Looks like a great recipe. What a great selection of ideas for Christmas! I love making balls at the moment and would especially like to try the hazelnut balls as they look so tempting!